This month, after 12 seasons, the Fox series Bones says goodbye. Any show on the air more than a decade will have its good and bad moments, and it may even jump the shark multiple times, but something about Bones has kept it going. Most people would probably point to the quirky chemistry of its main characters, Dr. Temperance Brennan (Emily Deschanel) and Special Agent Seeley Booth (David Boreanaz), as the reason for its long survival. Booth and Brennan and their opposite ways of navigating the world are immensely enjoyable to watch, of course, but that’s too simple. As a grad student, even though I’m outside the sciences, I also appreciate the small, comic moments surrounding lab politics (“King of the lab! ;) and academic honorifics. (Starting from the pilot episode, the Jeffersonian Institute’s then-head honcho is known to only speak directly to people with PhDs and ignore the lower beings; Dr. Brennan herself makes a rather aggressive point of only using “Mr.” or “Ms.” to address her interns until they’ve earned the title of “Dr.”). I also learned, while studying for a fitness certification, that I actually know a lot of the body’s bones because of the show. (If only we had a sports medicine-themed primetime drama so that I could be better at muscles.) The plausibility of the show’s crimes and discoveries is irrelevant, as it is with any other procedural, because they still make for a fun, watchable story. As a denizen of TV Twitter who participates in live tweets of award shows, celebrations of diverse casting, feminist critiques of plotlines and character shipping, I have to wonder, though—why didn’t we talk about Bones more? Bones currently has six credited main cast members. Three of them are women, and two are women of color. All three are scientists. Why on Earth have we not been talking about how cool this is? When I was growing up in the 1990s, STEM (science, technology, engineering and math) was not an acronym yet, though people were already starting programs and initiatives to encourage girls to go into it. I did a program called Girls in the SYSTEM, where I learned why you should build structures with triangles and arches, not rectangles; did puzzles and Happy Cube; dissected owl pellets. I didn’t recognize at the time what the program meant or why it mattered, but I see now how valuable it was to have scientists of all genders taking their time just with me and other girls, without boys to throw materials around and make a mess or do everything for us. Sure, the science was cool, but even cooler was the fact that I was in a space designed for me. And I got to see young women who were graduate students in STEM fields, giving a more solid example of what careers in science looked like by steps, rather than jumping straight from fifth grade to working scientist with a doctorate. If we celebrate racially diverse and female-centered superhero shows on the CW and Netflix and what they can do for young people who finally see themselves in one of the most prominent areas of cultural folklore, why have we not been celebrating Bones for how it does the same thing with the real world? 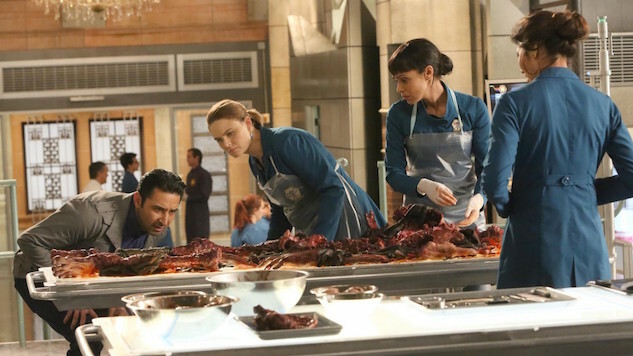 Bones successfully depicts the world as it is and offers up a bit of a utopia—in the same way that another revolutionary show, Grey’s Anatomy, doesn’t shy away from storylines involving racism, homophobia or other issues, but also allows its marginalized-identity characters a reprieve from some of the microaggressions that would plague their real life counterparts. In the world of Bones, we have three powerful, scientifically minded women who know what it’s like to be women in America, trying to balance work, family and fame, but who also enjoy positions of power and are respected by others instead of being constantly challenged. There are so many ways that anyone, but especially young women, can be inspired by Bones’ leading ladies. Take Angela Montenegro, played by Michaela Conlin: Angela is an artist, which, sure, is seen as a “soft” field. But she’s a forensic artist, and tell me the last time you saw a crime show using a female actor to portray a sketch artist. What’s more, Angela is also a computer engineer and hacker who combines her abilities into the Angelator and Angelatron, computer simulators that allow her to recreate the scene of the crime and postulate about angles of impact, types of weapons, and more. (Wildly implausible, but like I said, who cares? Very little tech in any crime show is plausible.) Angela is openly bisexual, and neither she nor any of the show’s other characters ever delve into stereotypes about how bisexuals just “can’t choose.” She’s very open about how sexually experienced she is, and while she gets some light teasing for it, thankfully none of it ever feels linked to stereotypes of Asian women (the actress and character are half-Chinese) and their sexual proclivities or identities. Forensic pathologist Dr. Camille Saroyan, portrayed by Tamara Taylor, joined Bones in its second season. An administrator in a workplace drama is a character who can aid or hinder the heroes of the show while leaving the really villainous acts to the murderers. In Saroyan, we have a sort of friendly antagonist-ally. Both methodically and compulsively dedicated to following the rules, Cam keeps her employees (and friends) in check but doesn’t ride them, and she puts up with them when they steamroll her; in turn, they apologize or show their appreciation in the end. A smart, powerful black woman with an impressive (if strange) resume—including stints as a cop and a coroner—Cam has never been angry or sassy. She’s everyone’s dream supervisor, who can have drinks with you on Saturday and keep you in line on Monday, and never make you doubt her absolute sincerity and commitment to being both friend and boss. Though she has bad luck romantically—itself is a realistic portrayal of today’s educated black women, who are single to a large degree, or otherwise unmatched in educational attainment with their partner—she creates her own family out of her coworkers and her former-almost-stepdaughter (just watch the Season Four episode “The Doctor in the Den”), whom she adopts and sends to college. And let’s not forget Brennan herself. She certainly never lets anyone forget that she is the foremost forensic anthropologist in the world, nor that she is a bestselling author, nor that she has one of the highest IQs anyone is likely to have encountered. She is obtuse when it comes to pop culture and abrasive when she means to be blunt and technical, which we tend only to see in male characters who are too academic or too nerdy for their own good. Brennan is Sheryl Sandberg’s dream. She makes more money than her husband, who occasionally struggles with that, but never diminishes herself or apologizes in order to make up for it , as so many women are wont to do—or asked to do, for that matter. Lots of people are turned off by her, and she doesn’t care at all. Because she’s human, she feels a twinge of jealousy when someone else succeeds around her (say, when Angela receives a MacArthur fellowship in one recent episode), but she celebrates their achievements when she feels they are truly worth celebrating. Brennan doesn’t do anything Brennan doesn’t want to do, and she is rewarded with respect from her peers, a high income bracket and a job she loves. While we should all strive to be better at recognizing pop culture references, we could also learn a thing or two from her immutable self-respect. As the series nears its conclusion, the women of Bones (including its revolving cast of interns and recurring characters) deserve our thanks. One woman proves that art and science are not at odds with each other; another handles the annoyances and social disruptions of being in management with aplomb; the third accepts only the best in herself and others. They are incredible role models, and not just for the sciences. In that same study from 2002, the author concluded that it is not the job itself, but the presence of successful role models in any socially valuable position, that influences young people of a similar race and gender. I hope today’s young women, and tomorrow’s, discover Bones in syndication and learn to see themselves in all sorts of roles. The series finale of Bones airs Tuesday, March 28 at 9 p.m. on FOX. Sarah Hannah Gómez is a doctoral student at the University of Arizona, where she examines issues of race, gender, and class in children’s and young adult literature. She has an MA and MS from Simmons College. When not reading, she teaches group fitness and does freelance editorial work. Find her at shgmclicious.com or on Twitter @shgmclicious.